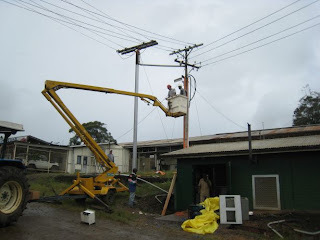 On Saturday I was involved with a big power project here in Ukarumpa. For the last couple of months we have been having power problems - one of our power feed lines kept burning in two. This is not good. The wiring was rather old aluminum cable that had been overheated numerous times from too high of loads. We had already patched the line twice, but knew that if the wire blew again there would be nothing that we could do to repair it, leaving many people in the dark. Our solution was to have a planned power outage and replace not only the cables with heavier copper cables, but also to replace the old (and now burned out) fuse boxes with new modern circuit breakers. We also decided that a Saturday would be the best day to do this since all the offices are closed and most people would just be at home. Too bad it was Susan’s birthday as well. We started at 7:00 AM getting our cherry picker into position and all of our tools and supplies ready before we turned off the power to half the center. Luckily our house was on the half that still had power. We tore out the old wire and fuse box (you can see the old fuse box on the ground outside the building) and then installed two new runs of conduit (the two orange pipes in the picture) with our new cables in them on to the power pole. Oh, and did I mention that it was raining most of the time we were doing this? 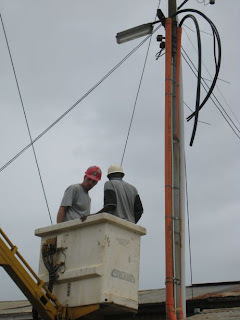 We had to mount a new box inside for the circuit breaker and then run the wires to all the right spots. Having a little portable generator set up outside to run power tools and work lamps, plus an electric tea kettle so the guys could have tea break helped the work go quickly. It took us until 5:30 before we had the power back on and the guys even gave me the honor to throw the switches back on. (Maybe they figured that if something was wrong I would be the one electrocuted.) The lights all came back on without a problem, so I guess we did it right. My job in all of this was really to make sure the guys had all the tools and supplies that they needed, run the banding tool to secure the conduit to the pole (something I learned working in a parts warehouse), and make sure Susan brought lunch at the right time. So not only do I get to share the light spiritually speaking, but practically as well.